Weekly Pay Checks from George Soros! Heinous Civilizational and Individual Crimes of Soros-Imposed Mind-Control Pathologies! Years of public school indoctrination – substituting Marxist multiculturalism for history – spawns far more wicked and dehumanizing crimes, than one can imagine! Soros not only pays for aborted fetuses but aborted thinking processes. The Soros crimes against humanity will never be fully measured! “Come on over!” said the long-haired blonde college student, running the Amnesty International kiosk. “How are things with Amnesty International?” I replied. “You’ve probably heard of the kidnapping increase, of females in our city,” she began. Silence. She could not reply. “I receive weekly pay checks from Soros,” she proudly replied, smiling. She smiled again. She actually beamed with pride it was underway. By the end of this revealing conversation, it was easy to see the potentially intelligent, blonde female model in her early twenties, could not think. She could easily be the next kidnap victim, judging by the patronage in the mall. The real answer to stemming the tide of local female trafficking is to strengthen the borders. But that was a politically-incorrect solution. She also hated Trump and Trump is in favor of borders, so strong borders couldn’t be a viable answer. She was a proud Citizen of the World receiving a weekly pay check from Soros. It all became clear. Just as leftists use freedom of speech to destroy freedom of speech, Soros, a Rothschild agent, is using cash to bring in a cashless society. Soros gives Amnesty International workers in shopping malls weekly pay checks! 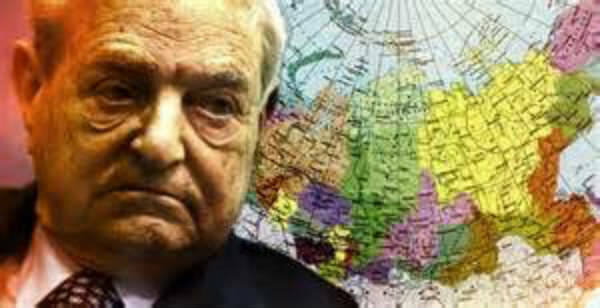 Soros is also using various crises – such as intensified kidnapping of females by immigrants, a condition he brought about through his internationalist Open Society – to bring in his management-by-crisis “solution, which is establishing Amnesty International in 163 countries through Citizen of the World staff… Even though not a single local female has been recovered! Clearly, the Amnesty International worker is an indoctrinated, dumbed-down, mind-controlled victim. A dupe and an unwitting useful idiot for the draconian Soros agenda. A Citizen of the World who hates nationalism, borders, Trump and real solutions. Soliciting money and memberships eight hours a day, from those who are equally dumbed down and victimized, is the progressive thing to do and pays well on a weekly basis. World government will be easily welcomed by these tragic victims of Soros’ de-humanizing Machiavellian mind control. This Soros-paid Amnesty International public-relations person, clearly, had never studied true history and its tyrannies… but was given instead Marxist multicultural studies from the fourth grade on. During the same formative years, responsible nationalistic civics courses were systematically absent. And this young woman had never lived under tyranny to know its dangers, but was developed as a liberal as were the Europeans who are now overrun. Amnesty International claims, “We are independent of any government, political ideology, economic interest or religion.” That claim is extremely dishonest. It is a Fake News lie. It is funded by Soros who is now Public Enemy Number One. Express to your local shopping malls – as well as high schools, colleges and universities – that Soros-funded Amnesty International is completely unacceptable and will not be tolerated.